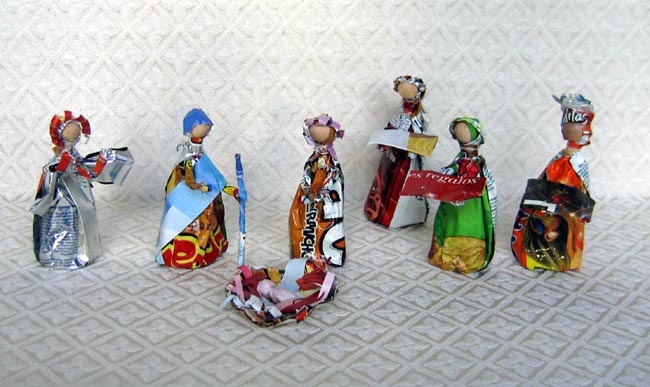 This Nativity set is made from snack bags fastened over wire frames. The bags are cleaned and cut or folded into the desired shapes, then glued to the frames. All of the figures have wood faces. The set includes seven figures: Joseph, Mary, baby Jesus in a manger, an angel, and three wise men with gifts. Joseph stands 3.25 inches tall. The set is made by a woman named Luz Padilla in Trujillo, Honduras. She and her husband Adan have a son and a daughter. They run a small grocery store from their home for income. Luz enjoys being creative and making fashionable beaded jewelry and other crafts to sell.